Exaltation degrees are specific degrees of the zodiac where planets are said to be most exalted within the sign of their exaltation. They’ve fascinated astrologers over the centuries because it’s been such a tantalizing mystery about how and why such specific degrees would be noted as being particularly fortunate for each planet. I’ve recently discovered that the exaltation degrees seem to be based on a 60-fold division of the zodiac, which appears to be a feature of the sexagesimal 60 base numbering system used by the Babylonians. I am almost certainly not the first person to figure this out, but if you’ve ever been puzzled by the exaltation degrees, this might be a good jumping off point with some recent insights I’ve made into their organization. So one thing I think is pretty clear – the signs of exaltation had to be determined first before the degrees of exaltation. You’ll see why as I explain. How did we get the signs of exaltation? Each planet’s sign of exaltation is like itself, according to its benefic/malefic nature and diurnal/nocturnal status. Because the Sun is purely diurnal, its exaltation has to be in a diurnal relationship to its sign of Leo. The trine has a diurnal connotation, probably because exterior planets in a waxing trine to the Sun are moving towards their greatest visibility at night. This is reflected by the fact that the Sun’s Joy in the 9th is trine the Ascendant, spearbearers are planets rising ahead of the Sun within a trine, etc. 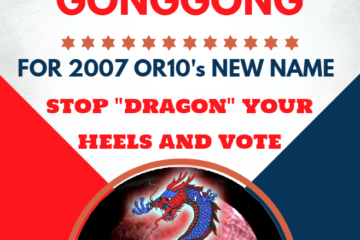 So the only two possible candidates are Aries and Sagittarius. 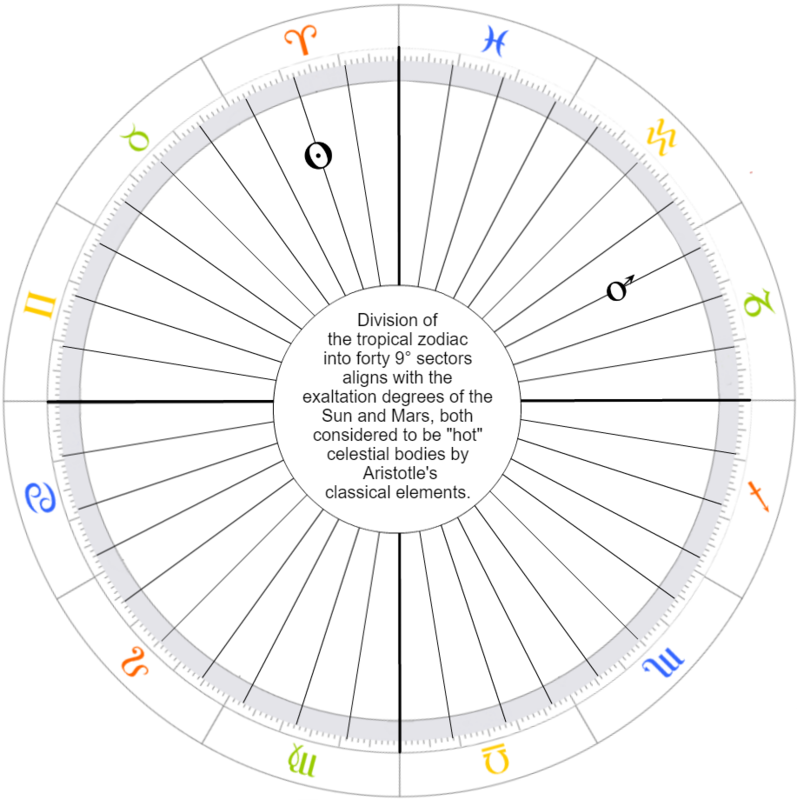 In the Thema Mundi, Sagittarius is below the horizon and the 6th is typically in aversion to the Ascendant, but Aries is above the horizon and angular to the Ascendant. So the Sun has its exaltation in Aries, trine to Leo and diurnally placed in the Thema Mundi. Because the Moon is more nocturnal, its exaltation has to be in a nocturnal relationship to its sign of Cancer. 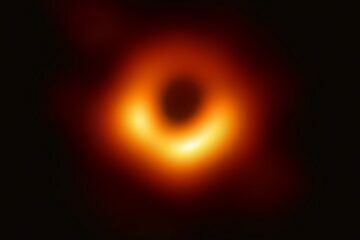 The sextile has a nocturnal connotation, probably because planets in a waning sextile to the Sun are moving towards their greatest invisibility as they go to conjoin the Sun. This is also reflected by the fact that the Moon’s Joy in the 3rd is sextile the Ascendant, spearbearers are planets setting behind the Moon within a sextile, etc. So the only two possible candidates are Taurus and Virgo. While Virgo is nocturnally placed, its ruler Mercury is not nocturnal or diurnal, whereas Taurus’s ruler Venus is a nocturnal planet. So the Moon has its exaltation in Taurus, sextile to Cancer and in the same relationship to the Sun as it has by domicile. The Sun and Moon are in adjacent signs by rulership (Cancer and Leo) and by exaltation (Aries and Taurus). Because Mercury is neither nocturnal or diurnal, and does not have a specific benefic/malefic designation, there is no aspect it should get in relation to its domiciles, which means that its exaltation has to be one of its own signs, Gemini or Virgo. 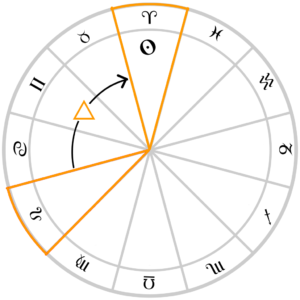 Virgo is in an aspect to the Thema Mundi Ascendant whereas Gemini is in an adjacent aversion. So Mercury has its exaltation in Virgo. Because Venus is a nocturnal benefic, its exaltation should be a sextile from one of its signs of Taurus or Libra. So the available options are Cancer, Pisces, Sagittarius or Leo. Pisces and Cancer are the only nocturnal signs, and Pisces is the only nocturnal benefic sign to match Venus as a nocturnal benefic planet. So Venus has its exaltation in Pisces. 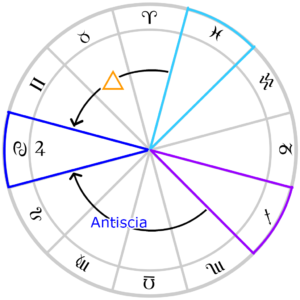 Pisces is in aversion to Libra, but we have to remember that these signs are in an antiscia relationship, one of the known mitigations of aversion. Pisces is also in a trine aspect to the Thema Mundi Ascendant in Cancer. Because Mars is a nocturnal malefic, its exaltation should be a sextile from one of its signs of Aries or Scorpio. The available options are Gemini, Aquarius, Capricorn or Virgo. Virgo and Capricorn are the only nocturnal signs, and Capricorn is the only nocturnal malefic sign to match Mars as a nocturnal malefic planet. So Mars has its exaltation in Capricorn. Capricorn is also square Aries, and the square is associated with the malefics. 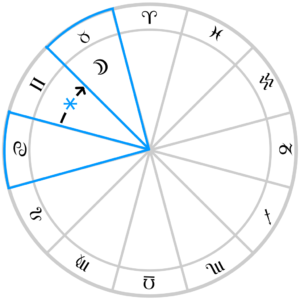 Capricorn is in an opposition aspect to the Thema Mundi Ascendant in Cancer. Because Jupiter is a diurnal benefic, its exaltation should be a trine from one of its signs of Pisces and Sagittarius. The available options are Cancer, Scorpio, Leo and Aries. It can’t be Aries because it’s malefic, and already taken by the Sun. It can’t be Scorpio because it’s malefic and nocturnal. It could be Leo because it’s diurnal, but it’s in aversion to the Thema Mundi Ascendant. It can only be Cancer, which is the sign of the Thema Mundi Ascendant itself. 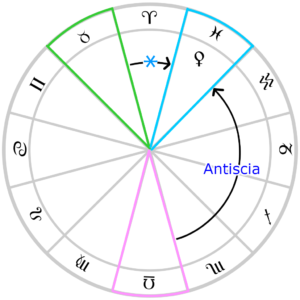 Like the other benefic Venus, Cancer is connected to Sagittarius via antiscia, one of the mitigations of aversion. Because Saturn is a diurnal malefic, its exaltation should be both trine and square one of its signs of Capricorn and Aquarius. The available options are Taurus and Libra, which are both square and trine both of Saturn’s signs. Aries would be the perfect fit as a diurnal malefic sign, but the Sun is already exalted there. Taurus is diurnally placed, but the Moon is already exalted there. 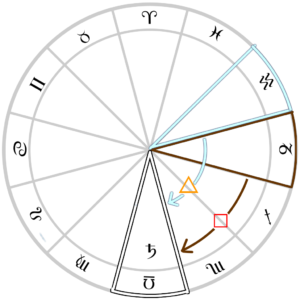 Libra receives a diurnal trine from the diurnal Saturn sign of Aquarius whereas it receives a malefic square from the nocturnal Saturn sign of Capricorn. So Saturn is exalted in Libra, the last place it can go. This also keeps Saturn in the same relationship to the Sun as it has by domicile. The Sun and Saturn are in opposition by rulership (Leo and Aquarius) and by exaltation (Aries and Libra). So what about the Exaltation Degrees? I’m probably not the first person to figure this out, but here’s my working theory of the Exaltation degrees. 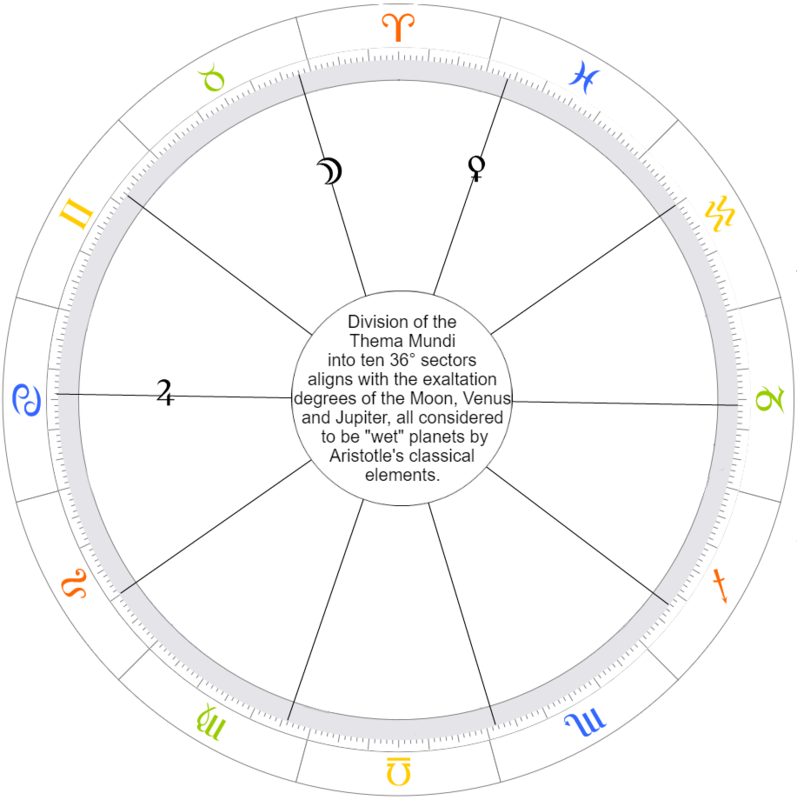 The exaltation degree of Jupiter is the 15th degree of Cancer (14 Cancer). This just happens to be the same degree of the Ascendant in the Thema Mundi. If the exaltations came from the Thema Mundi, why wouldn’t the exaltation degrees? 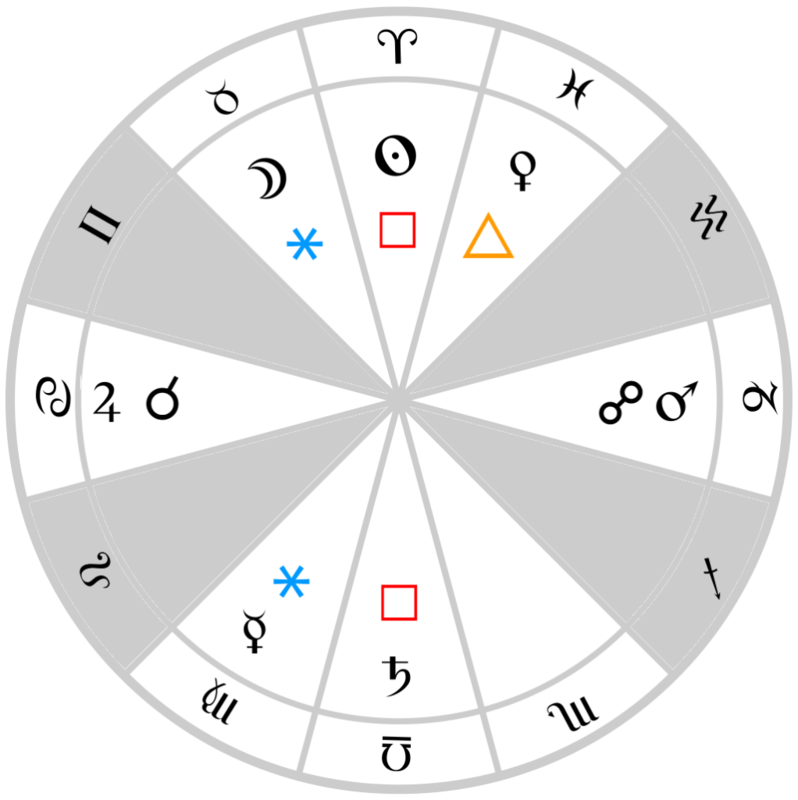 When you divide up the Thema Mundi by 10, the divisions align with the exaltation degrees of the Moon, Venus and Jupiter. The one thing these three planets have in common is that they are considered “watery” or “wet” according to Aristotelian elements. The Moon is cold and wet, Venus is cold and wet, while Jupiter is warm and wet. For whatever reason, the division of the circle by 10 is associated with water. This arrangement also contains both benefics, so perhaps this is a more benefic or stable division. 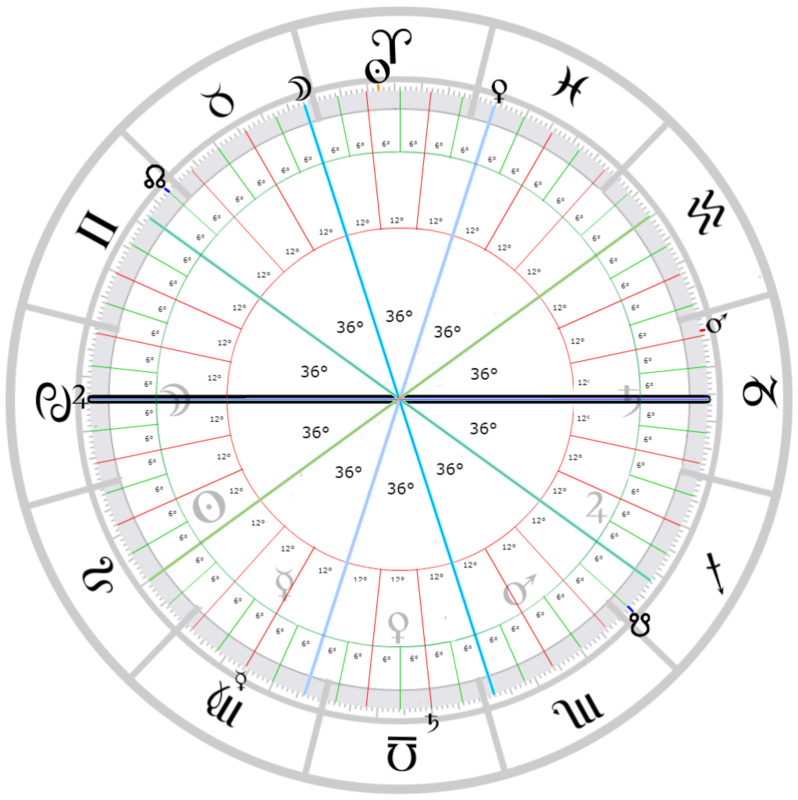 When you divide those 36° sectors into thirds, essentially dividing the Thema Mundi into thirty 12° sectors, the divisions align with the exaltation degrees of Mercury and Saturn. The one thing these two planets share in common is that they are both considered “dry” planets according to Aristotelian elements. Technically Jupiter’s exaltation degree is still represented by this division because it’s at the 15th degree of Cancer (14 Cancer). Together, Mercury, Saturn and Jupiter constitute the triplicity lords for the element of air. For whatever reason, the division of the circle by 30 is associated with air. 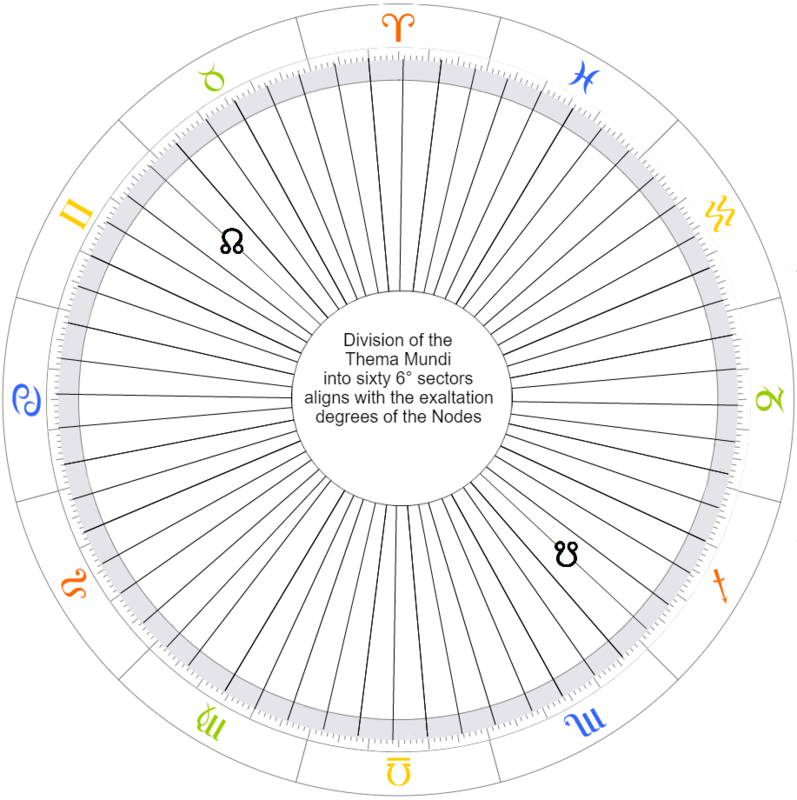 When you divide those 36° sectors into sixths, essentially dividing the Thema Mundi into sixty 6° sectors, the divisions align with the exaltation degrees of the Nodes. The exaltations of the Nodes seem to appear quite a bit later in the tradition but it seems worth mentioning here. Why they would specifically be at the 3rd degree of Gemini (2 Gemini) is anyone’s guess, although it may be to tie a connection to the Moon’s exaltation degree at the 3rd degree of Taurus (2 Taurus). As for why the North Node should be exalted in the Thema Mundi’s Gemini 12th house to begin with is mysterious since they do not have domiciles, although I rather like Curtis Manwaring’s speculation on this. 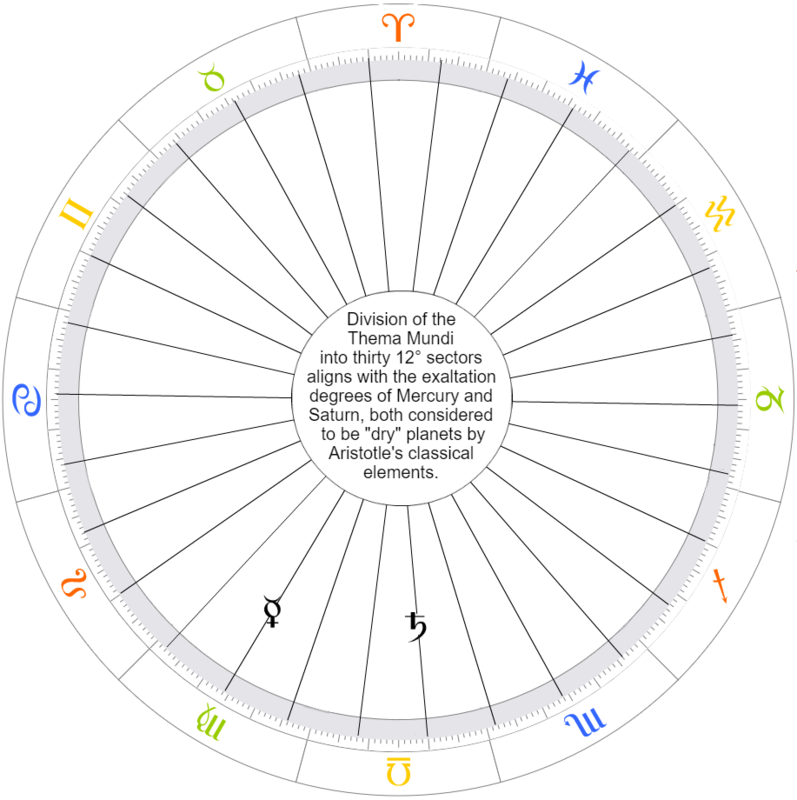 The fun thing about the sexagismal division of the zodiac is that it also incorporates most of the other planetary exaltations simultaneously, due to the high divisibility of the number 60. If you look closely, you’ll see the two exceptions to this scheme. What about the exaltation degrees of the Sun and Mars? 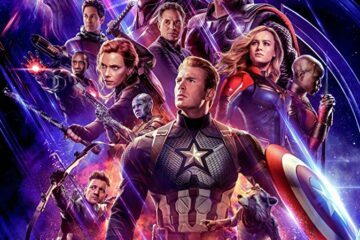 Mars is especially frustrating because if its exaltation degree was at the 27th degree of Capricorn (26 Capricorn) instead, then it would be part of the thirty-fold division, and the teams would be more balanced in terms of benefics and malefics. Even if you set Mars’s exaltation degree back by one, the Sun’s still makes no sense. There are a few reasons the Sun might be exalted at the 19th degree of Aries (18 Aries). One is that 19 is the closest square root of 360. Another is that the Sun’s period is 19 years. But I figure if the Sun and Mars both don’t conform to this arrangement, that perhaps they do conform to a different one. 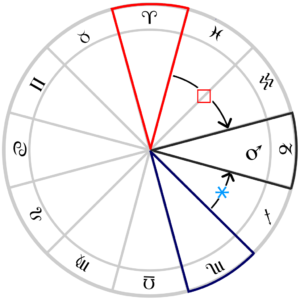 If you divide the zodiac into 36° sectors, and then divide those sectors into fourths, essentially dividing the zodiac into forty 9° sectors, then they align with the Sun and Mars exaltation degrees, but only if you use the equinoxes as your starting points, not the Thema Mundi. Why the exaltation degrees for the fiery celestial bodies are measured from the equinoxes rather than the Thema Mundi when the other planets are is anyone’s guess. 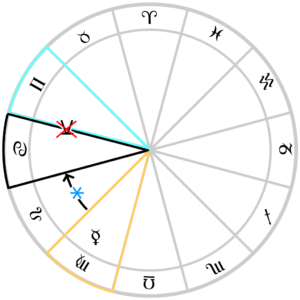 If you were to divide the Thema Mundi into 40, then the Sun’s exalted degree would actually be at the 15th degree of Aries (14 Aries) and Mars’ exalted degree would actually be at the 24th degree of Capricorn (23 Capricorn). At that point, only Mars would resist fitting into the sexagismal paradigm, but maybe that’s also because Mars will always put up a fight about everything. It’s interesting to wonder why the originators of exaltation degrees would have associated certain divisions with planetary natures, and potentially their elemental qualities. 10 for wetness/water/benefics, 30 for dryness/air/malefics, 40 for hotness/fire/malefics. There doesn’t seem to be an obvious arrangement for coldness/earth/benefics except perhaps 60, which connects the Moon, Venus and Saturn, the cold planets. 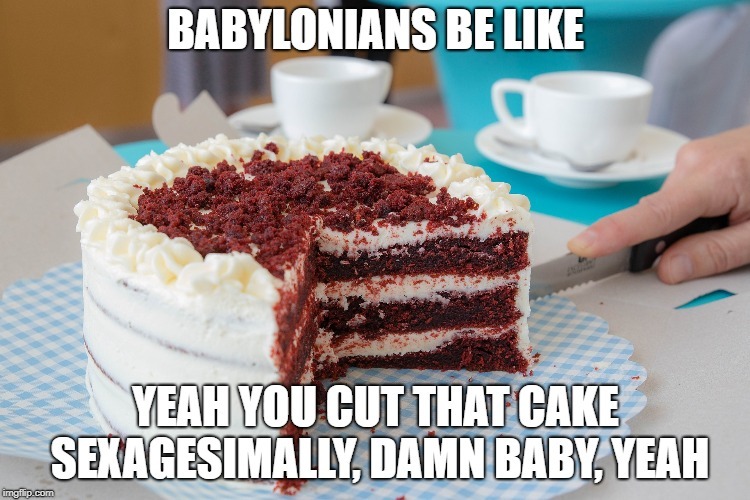 Maybe I’m totally off-base and someone who knows more about Babylonian mathematics and religion could have a better answer. For now, that’s what I got on the exaltation degrees, and hopefully this will give you some more to chew on if you’ve ever pondered these astrological mysteries. Let me know your theories!